DrinkWire is Liquor.com’s showcase for the best articles, recipes and reviews from the web’s top writers and bloggers. In this post, The Garnish Blog offers a tiki cocktail. Now that we've covered a couple of well known Tiki drinks for #TikiTheSnowAway, I thought it was high time that I tried my hand at inventing my own. It can be intimidating to put together a good Tiki cocktail, because there are so many moving parts - different rums, multiple kinds of juice, and long lists of ingredients. But at the same time, a lot of the components of classic Tiki drinks are mixed and matched in different recipes, and they all play pretty well together. Sometimes it seems like it's hard to go wrong. I knew that I definitely wanted to include coconut cream in this recipe. 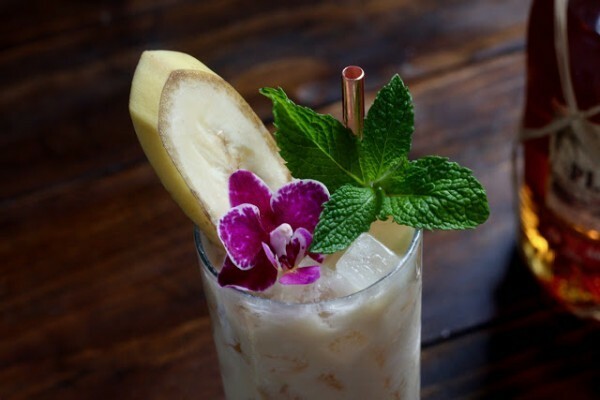 It's a key ingredient in one of my favorite tropical cocktails, the Piña Colada, and I love the flavor and texture that it lends to a cocktail. There are a few well-known Tiki recipes out there that are made with coconut cream - the Tradewinds is probably one of the better-known ones - but it's not a super common ingredient. 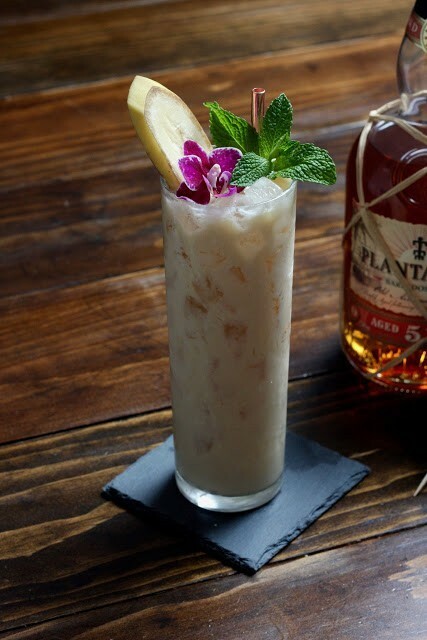 I thought the coconut would go really well with another current favorite of mine, Giffard Banane du Bresil, a banana liqueur that I'll be featuring in a Bottle Swap post next month. And so the Banana Stand was born. A bit of Allspice Dram gives it a bit of a coconut banana bread flavor, but lime and rum keep this smooth cocktail tasting tart and tropical. It's pretty heavenly. Combine all ingredients in a shaker with ice and shake very well to combine the coconut cream. Strain into a Collins or Zombie glass over crushed ice and garnish with a banana slice, a sprig of mint, and anything else you like!